Facebook has just launched a new feature called ‘People you may know’, which crawls through your friends list and finds people who share more than one friend with you. I’ve already found several friends I didn’t have on my contacts through using this tool. 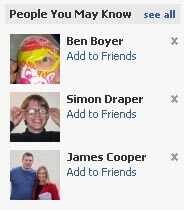 The best thing about this feature is that it shows you people you may know, together with a list of your mutual friends. This has led to some ‘small world’ moments for me already as I’ve noticed a few people who know several friends of mine, who I know from completely unrelated parts of my life. For example, a girl I went to University with is friends with several people I worked in Cardiff with… how? Then some girl in Bristol is friends with my flatmate, and someone I work with now… and they’ve never met each other? Plus they’re all from different parts of the UK! 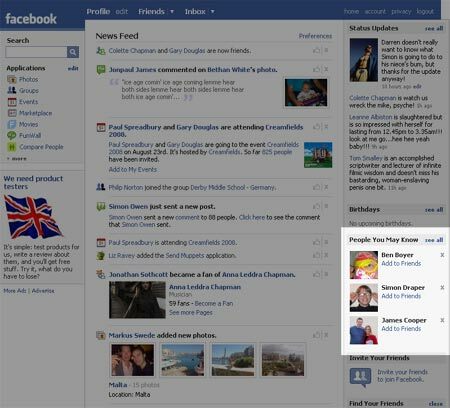 This is really starting to open up some networking questions and could be one of Facebook’s best features to date.